Hello there everyone. Here’s just a quick post to prove that I am not dead, but still alive and kicking! I have had such a crazy couple of months getting this business of the ground whilst working at the University of Manchester and Manchester Metropolitan University. Phewee! There’s no rest for the wicked as they say (and if it is true then I must be extremely wicked indeed). One vegetable that ranks very highly in my favourite foods is the humble beetroot; it would certainly be in my Top 10. Jane Grigson wrote a fantastic book called Good Things in which each chapter focusses on her favourite ingredients. If I were to write my own version, beetroot would be included. It’s that mixture of sweetness and earthiness that you can’t really get from anything else. Some people shudder at the thought of it as a vegetable in its own right – too much overcooked purple mush at school has not done it any favours – and only really eat it as a pickle. It is actually a very versatile vegetable; you can boil it, roast it, pickle it, and by virtue of its sweetness, use it as a cake ingredient that surpasses the carrot. Beetroot has been cultivated for centuries and its ancestor is the sea beet Beta marinama a rather common plant found around the coasts of Eurasia, especially along the Mediterranean Sea. It is from this plant we get today’s red beet (plus several other varieties like the golden beetroot) as well as sugar beet and the less well-known mangel-wurzel or mangold. The latter is used mostly as animal fodder, though it has been a food crop for people too in the past (for those of you that remember it, the scarecrow Wurzel Gummidge had a head made from mangel-wurzel). The history of sugar beet is very interesting and deserves a post all to its own. Oddly enough, the beet plant wasn’t cultivated for its sweet tap roots at first, but its leafy greens. Indeed, our Swiss chard is also of the same species as beetroot and sugar beet. Eating the root didn’t catch on until the 16th century. There is loads of beetroot hanging around at the moment and it should be reasonably cheap in the greengrocer’s shop this time of year, so you should jump at the chance to having a go at preserving them. I got a huge batch from Manchester Veg People. I have already provided a recipe for curried beetroot chutney, but I thought I’d give you the recipe I use to pickle beetroot as well. I first came across it in Good Things (1932) by Florence White, who mentions that the recipe must be very old, though she mentions neither when it was written or by whom. I did find an almost identical recipe as I was flicking through a copy of Mrs Beeton’s Book of Household Management (1861; which can be read online; see this link here). It is the inclusion of an infusion of black peppercorns and allspice that really makes this pickle special. You’ll never go back to buying jars of it ever again! It’s important to remember to not peel the beetroots before you cook them, otherwise their wonderful colour will be lost to the cooking water. Top and tail but do not peel the beetroot, then simmer them in plain water for around 30 minutes until tender. Very large ones may take over an hour to cook. Meanwhile, boil up the vinegar with the spices and simmer for 10 minutes then strain. Let the beetroots and vinegar cool completely before peeling and slicing the beetroots. Put into sterilised jars and cover with the strained, cooled vinegar. In two weeks they’ll be ready to enjoy. A while ago, I discovered a recipe for a 19th century British curry (see here for the original post). The recipe required me to prepare both a curry powder and a curry paste. It made a very good, strongly spiced curry, but ever since the jars have been sat in my fridge. I thought there must be something else I can do with these concoctions. 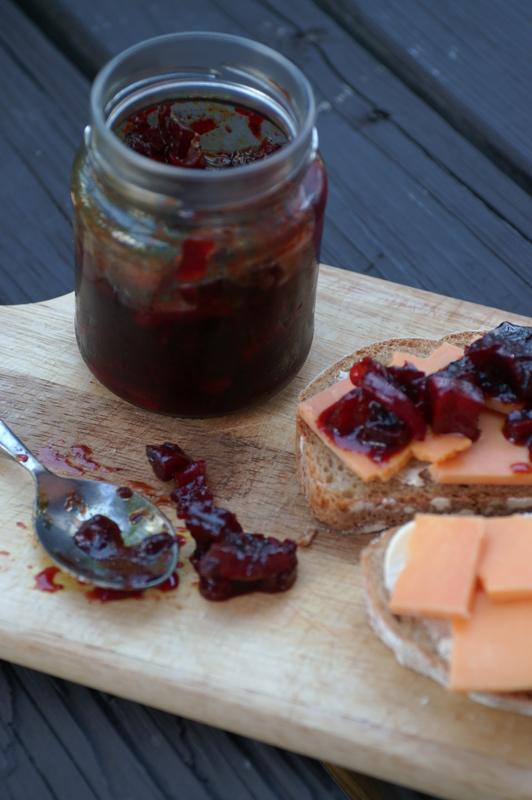 After a little thought I came up with this chutney idea and it works very well: the earthy beetroot is very sweet which offsets the spices very well. I thought of beetroot because I often panfry beetroot in olive oil with cumin seeds and always thought the combination delicious. Because beetroot is so sweet and quite a lot of sugar is required for the syrup, I include a quantity of carrot, otherwise I think the sweetness and beetroot flavour may make it a little too rich. It is delicious with cold meats or cheese and is also a great alternative to mango chutney as a condiment for a curry. The recipes for the curry powder and curry paste needed for the pickle can be found here. 3 tbs flavourless cooking oil such as sunflower, canola, groundnut &c.
Heat the oil in a stockpot or large saucepan – you need it quite hot, don’t be scared, the hotter the better. Toss in the cumin seeds and fry in the hot oil for around 30 seconds, then add the curry powder and paste. Stir and fry for around 2 minutes then add the remaining ingredients. Bring to a steady boil, then make sure the sugar has dissolved before letting it simmer away for around 90 minutes until the beetroot is tender and the vinegar and sugar have formed a thick syrup. Pot into sterilised jars. The chutney can be eaten as soon as it is cool, but it is best to leave it for a couple of weeks to develop its flavour.